Reduce the efforts of the customers to talk with a 2ndMove sales representative. Using LiveChat at their 2nd Move site as an additional form of communication. Increased number of visitors converting into potential customers. Europcar is a company that provides customers with access to the world’s largest vehicle rental network through its own operations, franchises and partnerships. A company is present in 150 countries. They offer a selection of rental cars from leading car manufacturers. Customers can choose between automatic or eco-friendly cars, luxury cars, minivans or even trucks if they want to transport something big. Europcar designed a 2ndMove.eu website to offer customers a secure and easy way to purchase a wide selection of vehicles from them, 24/7 from the comfort of their own homes. What makes them stand out from the competition is the simple 3-step buying process. To make the communication with customers fast and hassle–free, Europcar decided to look for a live chat solution. The goal was to directly communicate with customers, without having to fill out a contact form. 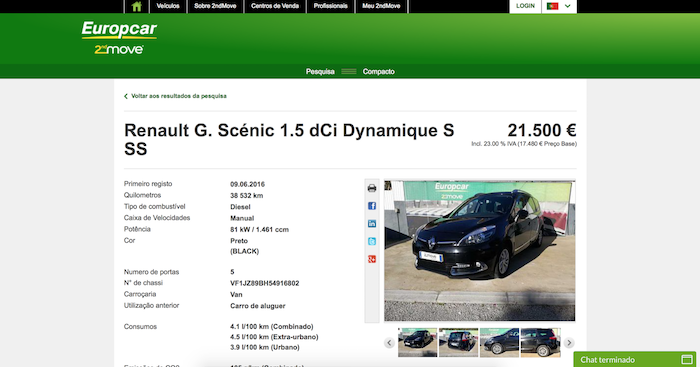 They use LiveChat as the main channel of communication between customers and their Europcar’s representatives, mainly for sales reasons. Their support team is 15 persons, but not all of them are logged in at the same time. We wanted to reduce the efforts of the customers to talk with a 2ndMove sales representative. They decided to try LiveChat because it was easily implemented onto all 2ndMove sites at a good cost. It’s additional communication support for our customers. As Europcar has international customers wanting to buy a car from them, they offer different languages in their chat windows. For example Italian, French, Portuguese. LiveChat window translates into 45 languages. It allows you to greet both domestic and international customers in their native tongue. They use pre–chat survey to gather customers’ names and emails. After a chat, they enable post–chat survey to ask about their service. This information helps to find out if customers are satisfied with the service or whether it should be improved. They also use ticketing form for the times when there’s nobody available on chat. Customers can leave their request that will be answered as soon as possible. 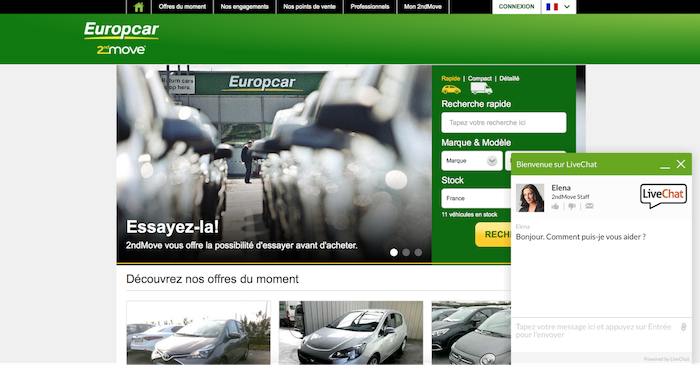 Europcar noticed that LiveChat is a great complement to the phone and emails. Since offering LiveChat on their website, they receive more chats than emails and solve customers’ issues faster. LiveChat helps in initiating conversations on the website, but calls are also required since some customers like to finish a case over the phone. The ease of LiveChat use is great for customers. When they have any questions during a sales process, they can be easily dispelled via LiveChat – right from the webpage they currently at. Besides helping customers on a daily basis, Europcar noticed another moment when LiveChat does its job. When they send their newsletters marketing campaigns, they see higher traffic on their website, the number of chat raises. Luckily, they can handle a few chats at a time and easily convert visitors into potential customers. When we conduct high volume newsletter marketing campaigns, the spike in traffic is reflected in the number of people using LiveChat. It converts a website visitors into a potential customers. So it’s really great! Having LiveChat as an initial form of communication for visitors increases the chances of turning them into customers. The hassle–free and fast communication is convenient for everyone: Europcar and its customers. It results in more visitors deciding to buy from Europcar than its competition. Europcar is a company that provides customers with access to the world’s largest vehicle rental network through its own operations, franchises and partnerships. A company is present in 150 countries. They designed a 2ndMove.eu website to offer customers an easy way to purchase a wide selection of vehicles with the use of LiveChat. Delivering better recommendations for customers through LiveChat.